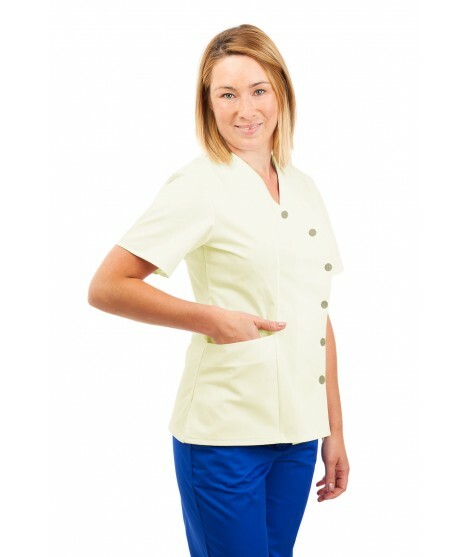 Another item from our buttoned uniform range, the T01 Ladies Tunic Revere Collar is a great option if you’re looking for a tradition style health care assistant uniform. Buttoned at the front and centre, the garment is accentuated by a lovely Revere collar and has all the usual lower pocket and side vent details. The uniform is made from our quality tested polyester cotton blend material (65%-35%) and can be customised with a range of uniform colours, trims and embroidery options. Like all of our tunics, the uniform is designed to look well and provide comfort during a long working day. Embroidery, monogramming and logos are a speciality of Medco and we offer a highly flexible service using modern techniques to enable us to logo virtually any design of your choice. There is no set up charge for this service and no minimum order quantity. If you need text embroidery, monogramming please enter the text in the box below and we will embroider the text as you have entered it in this space. We can accept virtually any digital format of your logo, JPEG, PDF, TIFF, word document format etc. Please simply upload your logo using the upload tool and we will then digitise the logo in preparation for embroidery. For assistance are more information please call us and we will be delighted to help with any queries you may have regarding your logo or embroidery requirements. You may contact us on our lowcall number 1890 929 588 or alternatively 026 41681. Please note that the logo, print and embroidery service may add up to 10 extra days for delivery. Embroidered and logoed garments cannot be returned for refund or exchange.